Love doesn’t always make sense. How do you love like a pig? You share a birthday cake or a bubble bath, of course. How could a window be lucky? It is, if it has a blueberry pie cooling on its sill. And how, just how, is a fossil funny? If you put it on your head! This nutty ode to affection has echoes of Ruth Krauss in its sensible absurdity. It begins by listing the many ways love makes the narrator (presumably the adult or child reading together on the title page) feel: “I’m happy like a monster. // I’m lucky like a window. // I’m smiling like a tuna. 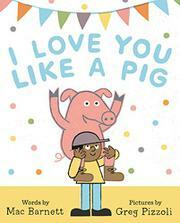 // Because I love you like a pig.” Then it dips into the antics of the loved one (“You’re crazy like raspberries”), followed by declarations of contentment (“I like you like a tree”). Each section ends with the titular phrase, punctuated by the resounding chorus, which extends across a double-page spread: “OINK / OINK / OINK / OINK.” Pizzoli’s digital illustrations keep up with Barnett’s wacky sensibilities at every turn. Ethnically diverse tots (and a pig, along with a few other critters) cavort merrily through the pages. Children will especially enjoy spotting the two mice that scamper throughout.